Our first Kentucky Derby was awesome! We went to THE hat party in Louisville the night before the Derby. My friend's brother and his partner throw this thing -- 250 guests -- media coverage -- and even had liquor sponsors this year. 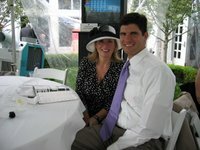 My friend, Amy, scored us awesome Derby tickets -- we were up with the celebrities and having lunch at the Derby museum. Best part of the whole day, though? The winning bet on Giacomo! (Sure, it was only a $2 bet...but it paid off all of our other gambling debts). Only downside? The mock mint julep -- damn pregnancy.